Both studying and reading are familiar terms within the learning process. Both are required in the process of completing the related studies. Studying is the process of fully concentrating and devoting ample time to the completion and research of a particular task. Reading implies the process of understanding and grasping the objectives and meanings behind the related content within the subject. Both correlate with each other and are inter-dependent e.g. reading helps with studying. These two processes however, differ in performance and nature. Studying is the process adopted by an individual where a complete devotion of time is required to fully understand and grasp a particular concept. Studying is quite similar to learning. By studying an individual is at a better position to remember concept for a longer duration. Studying also involves research, and thorough understanding of an array of topics within the subject. Reading is a process of going through a topic within a given subject in order to gain information from it. Reading requires the individual’s participation in order to fully understand the concepts. A reading process involves practice, development and proper refinement paired with creative and critical analysis skills. Text formats are clear and understandable through a reading process. Reading is best paired with studying in order to have better understanding and conceptualization of the topic. Both reading and studying involve going through a subject/topic. Studying and Reading are both required before going through an examination or test. Studying and reading are both practices adopted by students within institutions or on private learning systems. Both enable understanding of the subject or topic. Both reading and studying are practices that are carried out from childhood by human beings. Reading and studying are inter-dependent and complement each other well. In order to study well, you may also need to read well. Studying is the process adopted by an individual where a complete devotion of time is required to fully understand and grasp a particular concept. Reading is a process of going through a topic within a given subject in order to gain information from it. Less devotion and time are required for reading when compared to studying. Studying requires a lot more effort. In studying the main tasks involved include researching and learning. The tasks involved in reading include perusing through texts and understanding the concepts. Studying is more task involving. In studying remembering is very essential. While in reading remembering may not be that essential, understanding is more crucial. Studying is adopted when trying to understand complex topics or subjects. Reading is suitable for less complex topics and subjects that one is already familiar with. Studying is a process where complete devotion of time and energy is dedicated to understand a concept within a topic/subject. 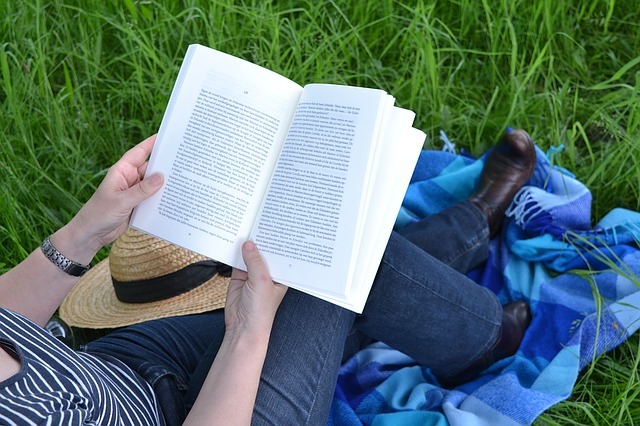 Reading involves going through a particular topic to gather information from it. Both reading and studying are practices adopted by students. 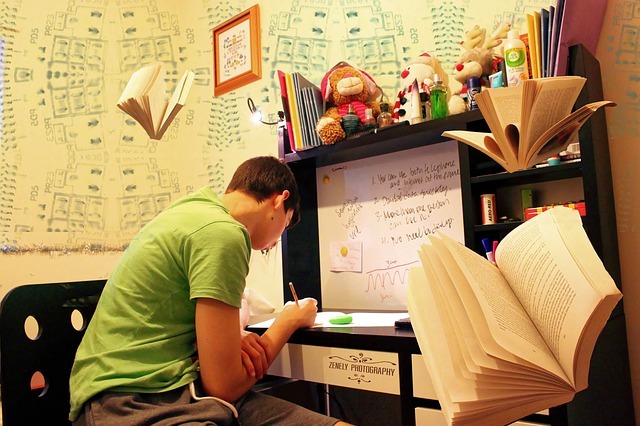 Studying requires more devotion, time and energy when compared to reading. Studying involves researching and learning while reading involves perusing through texts to understand concepts. In studying it is important to remember everything. In reading remembering may not necessarily be crucial. Evah Kungu. 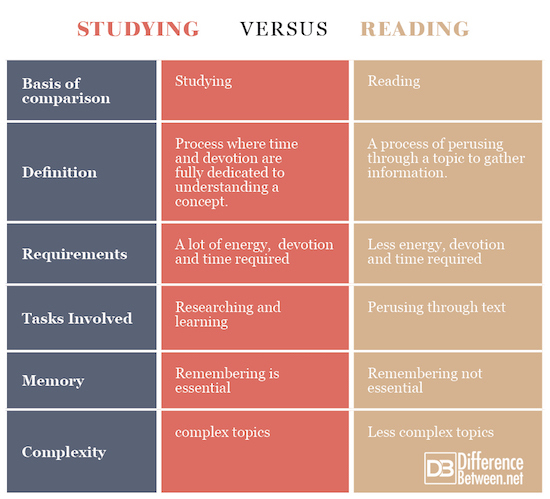 "Difference Between Studying and Reading." DifferenceBetween.net. June 4, 2018 < http://www.differencebetween.net/language/difference-between-studying-and-reading/ >. McConkie, G. W., Zola, D., Reading, U. of I. at U.-C. C. for the S. of, inc, B., Beranek, and Newman, Development (U.S.), N. I. of C. H. and H., & Education (U.S.), N. I. of. (1986). Eye movement techniques in studying differences among developing readers. University of Illinois at Urbana-Champaign. Riegelman, R. K. (2012). Studying A Study and Testing a Test: Reading Evidence-based Health Research. Lippincott Williams & Wilkins. Seidenberg, P. L. (1991). Reading, Writing, and Studying Strategies: An Integrated Curriculum. Jones & Bartlett Learning.